Today fun wedding favor – personalized tea bags – would be the perfect addition to a welcome bag for out-of-town guests at your wedding. Or you could pair them with a cute mug and make a fun tea time gift set for your guests. 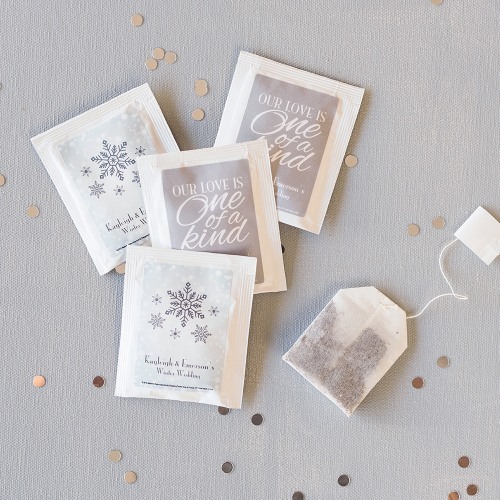 You could even set up a tea and coffee bar at your reception and feature these personalized tea bags, just to give your guests a sneak peek at what they’re taking home. The tea bags are a great way for guests to remember the fun they had on your big day. And you get to choose how you’d like to personalize the bags of tea – so many choices!